I’m not a big fan of platforming games, especially on a touch screen. They usually require a lot of precision, and despite my brain knowing what needs to be done, my fingers can’t always make it happen. I can probably count on one hand the number of platformers I’ve completed. 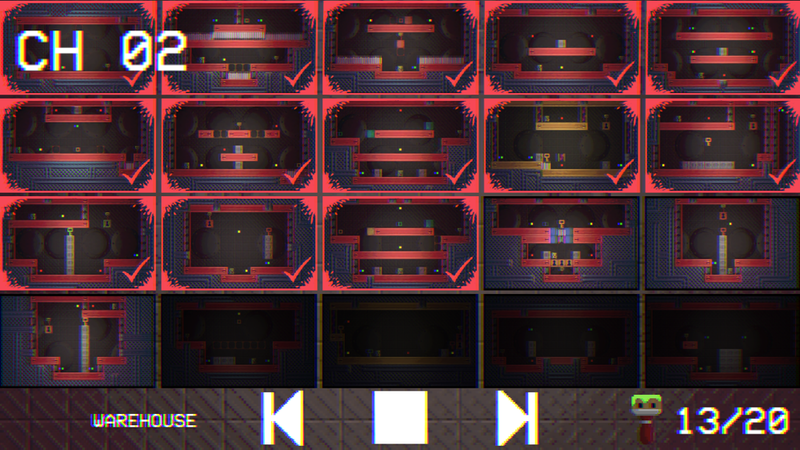 But I just finished every level of Acid Nerve’s new iOS game, Telepaint. 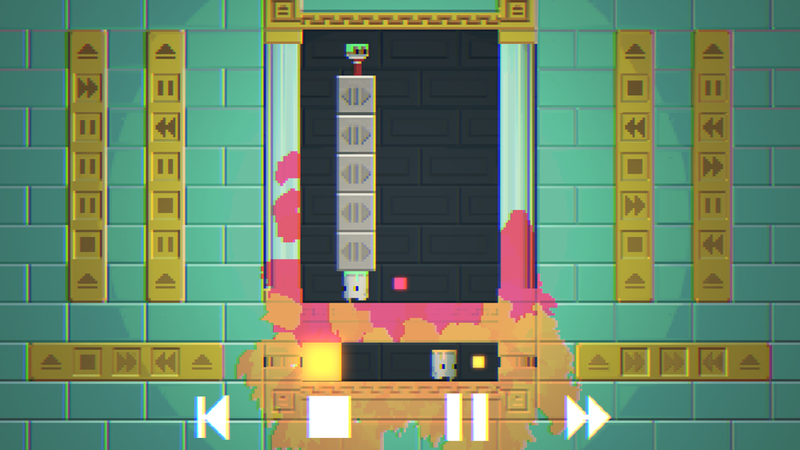 It’s basically a puzzle platformer for people who hate platformers. One might even say it’s more puzzler than platformer, and that’s why I like it so much. Either way, it kept me playing until I had a hundred percent completion. 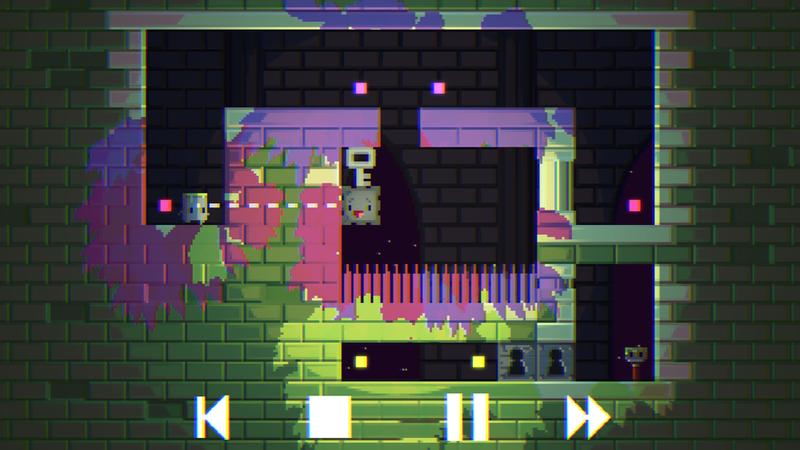 Telepaint features all the usual roadblocks you’d see in a platformer, plus some surprises. 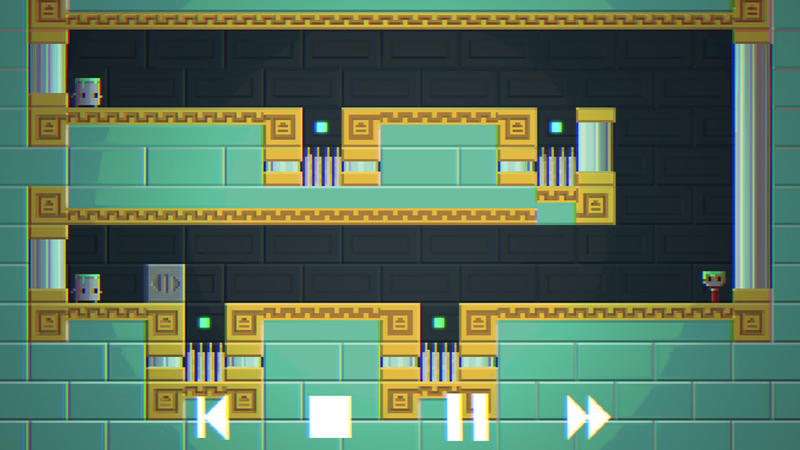 There are platforms (of course), gaps, spikes, locks and keys, sliding blocks, switches, anti-gravity and more. But instead of on-screen buttons or swipes to jump, you teleport. In fact, there’s no jumping at all. Sure, teleportation is not a new idea in games, but it is executed brilliantly here. The game consists of over a hundred levels split up into six sections, each gradually introducing new mechanics and building on old ones to cleverly add challenge. All the action takes place on a single screen, so you never have to worry about what you can’t see, the dangers that might be up ahead. It’s all right in front of you. The goal of each level is to get the walking paint bucket to the paintbrush. The only way to control anything on the screen is to tap on two little colored squares. The instant the second one is selected, any items that come into contact with them will teleport, swapping places. It’s a simple idea that lends itself to complex and tricky puzzles. It’s also perfect for touch screens, and shows that fitting the platform was a huge priority. Each level starts with the bucket(s) standing still so you can plan out your moves. Tap the screen and the bucket starts walking in the direction he’s facing. If he hits a wall, he turns around and walks in the opposite direction. You often need to use those walls to get him walking the right way before teleporting him to the intended location. If he’s facing the wrong way when you teleport him, he might end up walking onto the deadly spikes instead of onto the key. The game is not timed, so you can take as much time as you need to look at the layout and plan it out in your head. It’s a clever game that’s a lot more about brains than skills. Some levels will have more than one paint bucket and you might need to have them walk on each other’s heads to reach their goals. You can also build towers of blocks on their heads. There are so many different variables that keep things interesting. Even the levels that seemed a bit like filler didn’t bother me much because there were enough levels that made me feel like a genius when I finally solved them. It’s easy to make a small mistake and have to start over, but most levels aren’t too long or frustrating to play again. There were some times I wished I had an “undo” button to take me back to my last move. But this was mostly during the fourth section of the game, which introduced a magnetic block that pulls the two of you closer together if you get in its line of site. These levels require more precision than others and started to frustrate me to the point that I wasn’t sure if I’d be able to complete them and get to the next section of the game. But that was before I knew that you can perform your next move while the screen is paused. 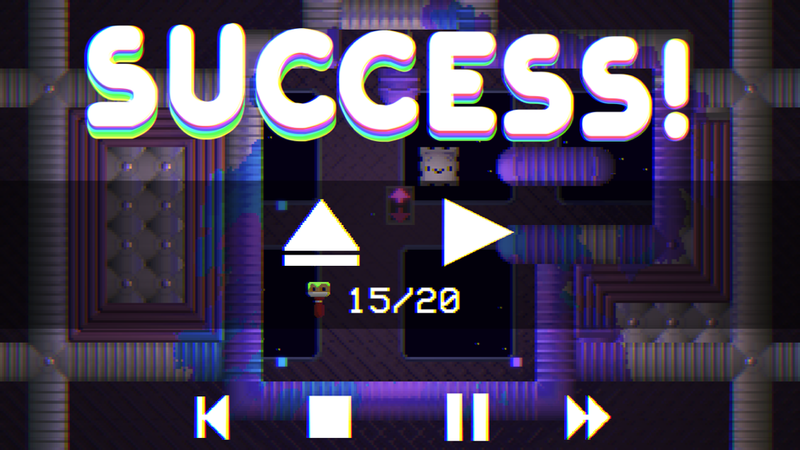 I managed to complete all the levels in the game because, despite sticking to some old school ideas like linear progression instead of all levels unlocked, the developers included a lot of user-friendly mechanics that enable players of just about any skill level to succeed. Even though you unlock levels in a linear fashion, you do have three levels available to you at all times. So if you’re stuck on one, you can work on the other two. The small caveat is that to move on to the next section, you do need to complete all but two of the current section. But the most helpful mechanic the game offers is the ability to pause the screen at any time and not only think about your next move, but execute it while the game is still paused. This literally changes everything. The pause button doesn’t make the more challenging levels easy, but it does make them a lot more manageable for those who don’t like fast or skill-based games. It allows the game to remain a relaxed puzzler from beginning to end. I do think it would have been a good idea to mention it in the tutorial, though, instead of expecting people to discover it on their own. It could have saved me a lot of frustration to know about it from early on. As a casual but challenging puzzler, the game is nearly flawless. I might have personally preferred to play the fifth section before the fourth, as I found it more manageable. I also have mixed feelings about the linear progression, including the fact that some really great content is locked away unless you complete every other level first. I usually prefer my story-free puzzle games to allow more freedom than that, but I was still able to get through the game as is. How much the linear progression bothers a player will depend on each person’s preferences and abilities. I also wish the game had iCloud saves so I could sync between my iPhone and iPad. Since it doesn’t, I decided to play only on my iPhone so I can take it with me and also so my two thumbs can cover the whole screen for the more time-sensitive levels. It might be a bit trickier on an iPad with things more spread out, but the pause button should definitely help out. 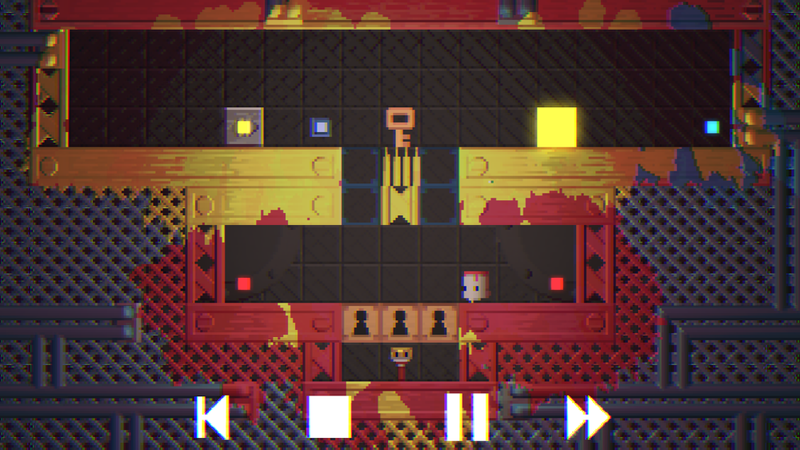 Besides the fantastic puzzle design, Telepaint shines in its presentation. I’m not the biggest fan of retro graphics or music, but both are done so well and ooze so much character, it’s hard not to fall in love. 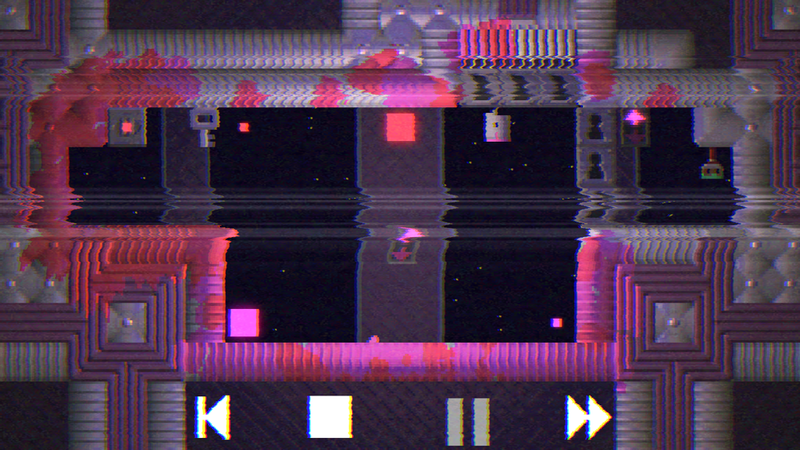 The design looks like an old CRT TV, along with static between levels and lines running up and down the screen. The controls look like those of a VCR, and the screen gets slightly distorted when you pause it. Every time you teleport something, paint splatters on the screen. Death also sends paint flying, and it all builds up in layers. When you tap the “rewind” button, it restarts the level but leaves all the splattered paint on the screen. It’s a really nice touch. The paint buckets and magnetic blocks also get very distraught looks on their faces when a paint bucket dies. All this is accompanied by an original soundtrack that’s varied, fits the mood, and that I never found annoying. It also has sound effects that, according to the developer, sync up to your actions. This all comes together to to create a charming atmosphere that I’d happily return to again. 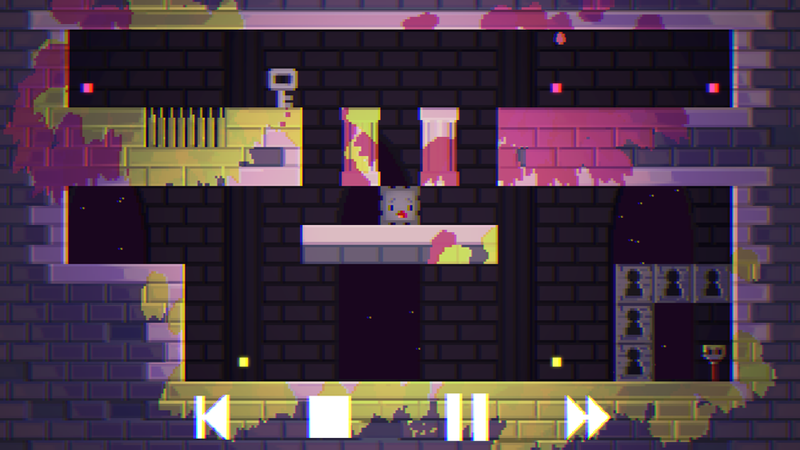 Telepaint has just about everything I could ask for in a touch screen puzzler. It’s designed around the platform’s strengths, instead of shoehorning a PC or console game onto a mobile device. If you’re a casual puzzle fan, I can’t recommend it enough. Any complaints I have are small ones that didn’t hamper my enjoyment of the game. I’m just sad it’s over. I would love to see some added content or — dare I wish — a level editor to allow for unlimited player-created content. But even as is, you’re getting a lot of bang for your buck, and no extra in-app purchases (IAP). If it sounds like something you’d enjoy, you can download Telepaint here. And if you’re already playing the game and need some help, try my walkthrough.